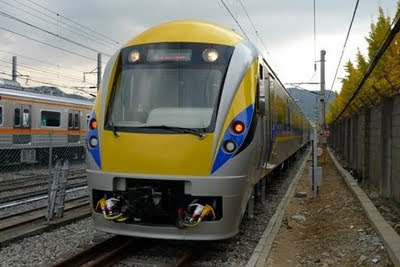 Initially, it will operate in Kuala Lumpur - Ipoh route, it might be extended to Padang Besar and Gemas in 2013. Top speed will be 160 km/h. At the moment, Kuala Lumpur to Ipoh train service is popular, with tickets usually sold out on Friday, Saturday and Sunday. The introduction of ETS is timely because of the existing demand. Travel time can be reduced by 1 hour, the ETS system is made in Japan, but the construction done in South Korea by ROTEM. 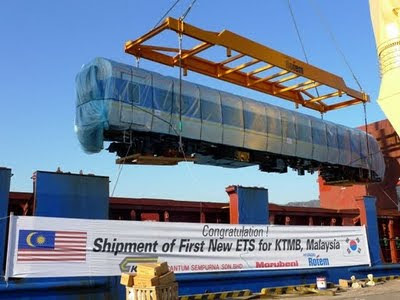 This is not the first electric train for KTMB, because KTMB operated their first electric train since 1995 on KTMB Komuter service. ETS is faster, more aerodynamic than EMU. It is used for longer distance, with 6 carriages on each set compared to 3 on EMU. ETS have interesting interior design, with air-conditioning, LCD television, disabled user friendly and equipped with Automatic Train Protection System. To keep the train drivers be alert on all time, ETS drivers have to press one button every 30 seconds to show their concentration. If the button is not pressed, the train will slow down and stop. ETS capacity is 350 passengers. Do you have any latest news on when the ETS will be in operation? HMMMM...NOT MATTER HOW SUPER CANGGIH THE COACH OF KTM WILL BE, THE TOP MANAGEMENT HAS TO LOOK AT SMALL LITTLE THINGS TOO. ESPECIALLY TIMETABLE. IT HAS NEVER BEEN ON TIME AND NEVER BEEN ON SCHEDULE ABOUT TRAINS IN MALAYSIA. I'VE TRAVELLED MORE THAN 5 TIMES, THERE HAS NEVER BEEN ON TIME AND ALWAYS DELAY. maklumat ini sangat membantu saya dalam PBS pra-u untuk tahun ini.. >,< terima kasih..!! Although I enjoyed the journey in the ETS between Ipoh and KL I felt cheated because it was promised that the journey time would be 1 hr 55 min but the service is too slow for an electric train. It only arrives half hour faster that the earlier diesel hauled shuttle trains. Why allow the service to stop at stations which are served by the Komuter and long haul intercity trains? This is pure waste of time and duplication of services.The objective of the service is lost. KTMB management should review the transit time with direct services between the two cities of Ipoh and KLS. If a survey is conducted it is not justified for the ETS to operate on transit mode with the poor boarding capacity against the ware and tare of the ETS units. Before ETS loose its ridership back to the buses, KTMB should hurry and rectify the schedule. KTMB should also produce some innovative buffet car service on board the ETS..... the most essential are the newspapers. Saya sering menggunakan khidmat ETS untuk ke KL Sentral. Masa yang diambil adalah lebih kurang 2 jam 25 minit. Namun kadang kala terdapat masalah semasa dalam perjalanan dan pada pendapat saya pemandu atau krew yang terlibat sepatutnya memberitahu sebarang kerosakan teknikal atau gangguan yang menyebabkan kelewatan masa tiba. 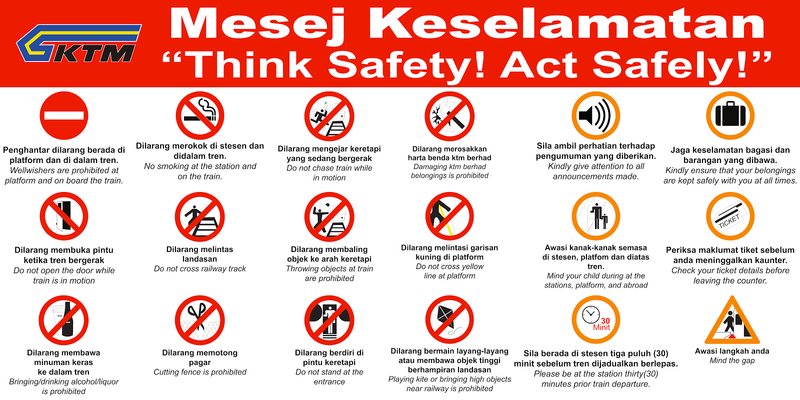 Ini kerana, masa ketibaan yang dinyatakan di tiket adalah 11.24 p.m. tetapi ketibaan yang sebenar adalah 11.50 p.m. Berkenaan jangkamasa yang diambil untuk perjalanan dari Ipoh ke KL Sentral selama 1 jam 55 minit dalah tidak benar sama sekali.